Here it is summer and I’ve been sampling a little of it all, so I don’t have a concise post to write. Here is some of my stream of life. Four-year-old Henry spent the night with George and me. It was his first night away from home alone and he was absolutely blissful to be an only child. He saw the truck and equipment quilt on a bed and declared “That’s my bed!” We visited my childhood by reading two of my favorite picture books. 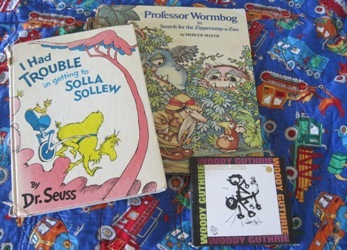 I think Carol gave me I Had Trouble in Getting to Solla Sollew. As a child I had ambiguous feelings about the book because while I knew that a perfect world didn’t exist, wasn’t a book just the place to explore one? Professor Wormbog in the Search for the Zipperump-a-Zoo has always delighted me with its detailed drawings. Professor Wormbog leaving Island Joe’s Rentals is one of my favorite illustrations. Henry and I listened to Bob and Louise De Cormier perform Woody Guthrie’s Children’s Songs on the way to Henry’s house. Take You Riding in my Car-Car is one of my favorites. We also picked peas in the garden. Henry: I will stick my gum on my shirt to keep it clean. Henry: Do them [these] need to be fried? Me: No, you can eat them as they are. Henry shares my enthusiasm for plants. He points out mullien (even as a wilted leaf on the road). He jumps off his bicycle to point out asparagus in the ditch (too big to eat, he correctly declares). While zooming by on his bicycle he says “I see strawberries!” and then corrects himself that he doesn’t (it was Virginia Creeper). That boy is learning the best stuff! Henry: [Arriving in the living room using my electric toothbrush.] I didn’t brush my teeth yet so I thought I should. Henry: Where is your toothbrush? Me: [Indicating the brush in his mouth] That’s it. Henry: I thought it was George’s. Each of Jack and Jenny’s boys has had a night alone with us now. It is busy enough when they are here that I haven’t gotten any photos of them yet. Robbie, Charlie, and Henry are such great kids that I hope that they can come again soon! 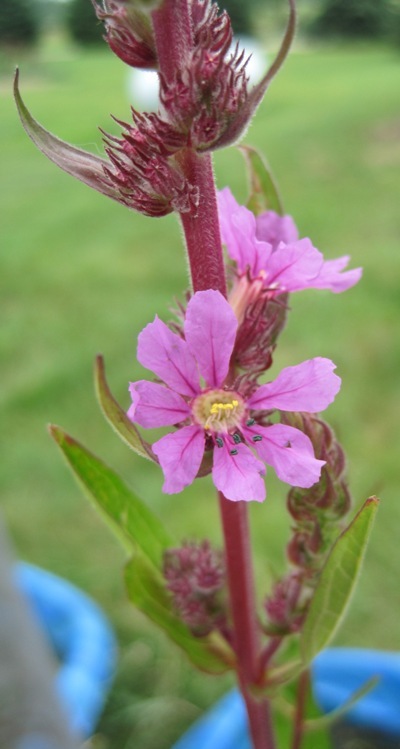 Purple loosestrife would be a beautiful if it wasn’t a non-native and invasive plant. 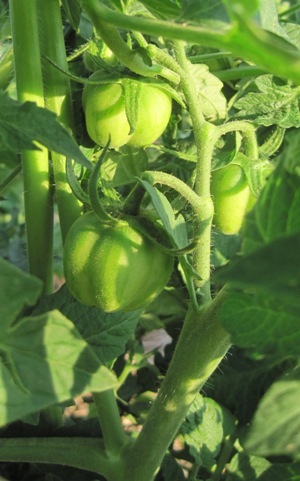 We are growing some to raise biocontrol beetles. 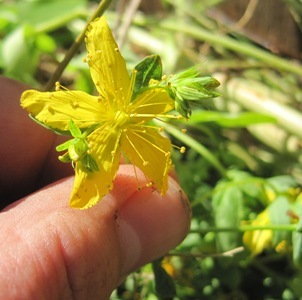 Invasive St. Johnswort has shown up on our farm within the last few years. We have been pulling it by hand, but it has expanded its range. 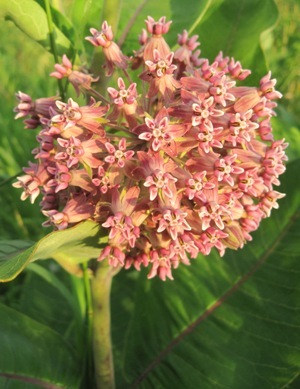 It is also more prominent in ditches and roadsides. We also have the native, non-invasive St. Johnswort in our wet meadow. George has been crazy busy cutting and dabbing invasive buckthorn. 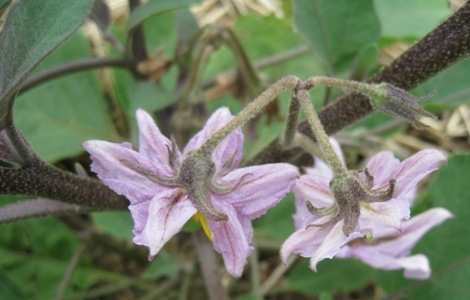 In the garden, eggplant and tomatoes are growing. 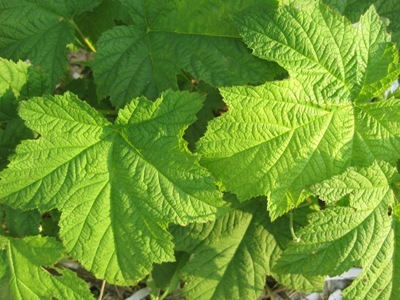 Carol gave us thimbleberry to plant and it is doing well in our yard and woods. Mom and Larry shared raspberries with us. Just like puppies, they look very appealing to me when they are small! 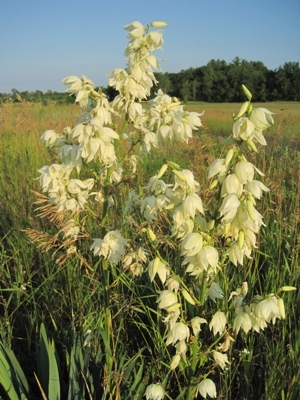 The yucca in our prairie is crazy pretty. 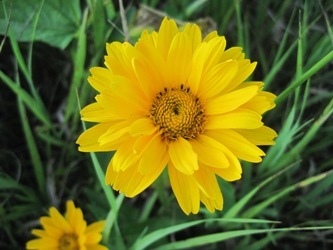 Prairie plants with yellow blossoms fall into the yellow flowers category for me. If you can ID them, let me know! 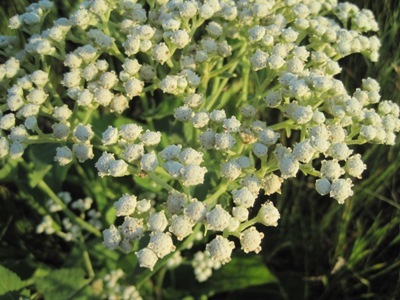 The wild quinine looks happy. 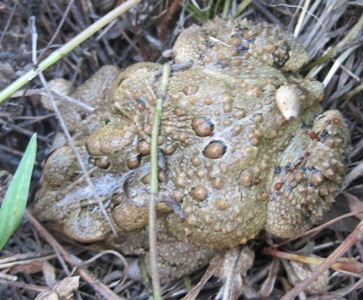 The toad was not interested in being photographed and kept hopping away. 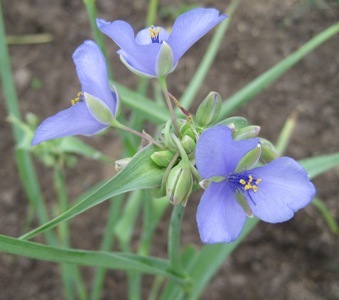 We have spiderwort in our prairie and flowerbeds. This one is in the flowerbed. 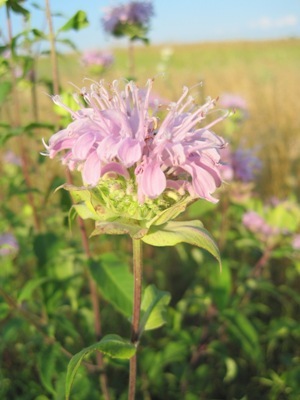 Monarda is a nectar species for the Karner blue butterfly. Milkweed is competing for space among our tomatoes. Luckily I can pull it out since there is much of it in our prairie. 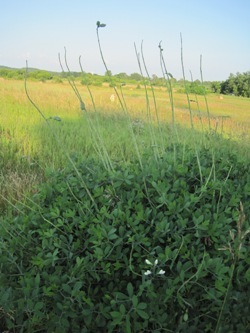 Deer eat the seed pods from our cream wild indigo every year. 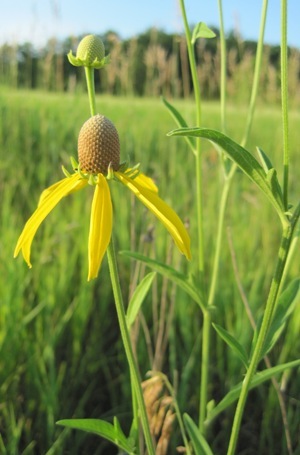 The compass plant in the prairie hasn’t grown upward in the prairie for the last ten years because of deer browsing. It is crazy big in the composted flower bed though! 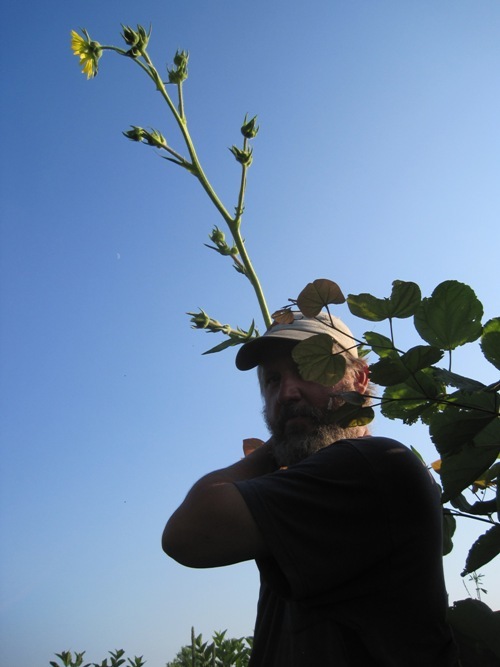 Here it is blooming above George’s head. The redbud next to it is happy too. 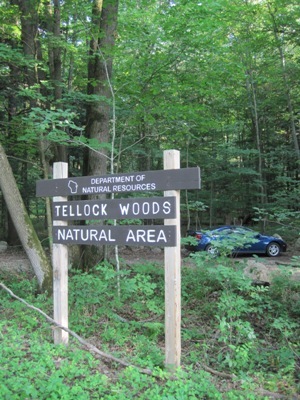 George and I visited Tellock Woods State Natural Area in the Town of Union. It is adjacent to a proposed silica sand mine site. We saw several small frogs (wood frogs, from what I could see before they hopped away). 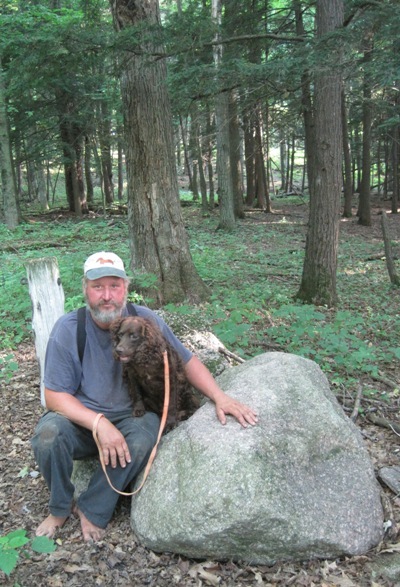 There is a nice grove of hemlock, but the area is so heavily browsed by deer that there is no understory in much of the woods. We will be back to visit after the frost when the leaves are pretty and mosquitoes dead. Summer reading for me has started with a book hangover. 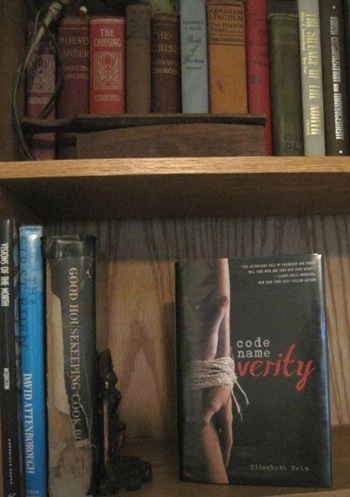 * Code Name Verity by Elizabeth Wein was almost a one-sitting book for me. The focus of the book is a friendship between daring young women in England during World War II. Men have been shipped out to fight and women have new opportunities, including becoming pilots to move aircraft and crews into position in England. Since the book focuses on war secrets, I won’t revel any more. Would I recommend it? Yes… for adventure loving young adults and adults, this book will keep you on the edge of your seat. No… for those who don’t want to (or can’t) read about the atrocities of war. Mom, this is not a book for you. In other news: I wish I had possession of an evil-eye to kill buckthorn with a glance, rather than cutting and dabbing it. 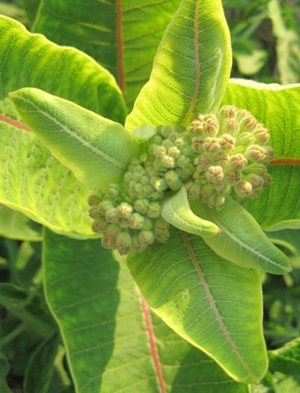 June is Invasive Species Awareness Month. 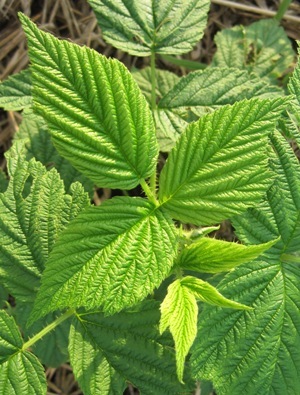 Go kill something invasive and unwanted. *Book hangover: The groggy, bleary-eyed feeling the day after staying up way too late reading a book that just can’t be put down.